After securing the first points of the 2012 Championship season, the Williams F1 Team is eager to score another good result at the Shanghai International circuit during the upcoming Chinese Grand Prix weekend. Mark Gillan, Chief Operations Engineer: "Having secured our first points of the season in Malaysia with what is a much improved and competitive car the team are eager to move onto Shanghai as soon as possible. The fundamental characteristic of the circuit is that it is aggressive on the tyres and the track will prove a stern test for the FW34 and will be a good indication of how improved our tyre management is compared to last season. Pirelli are bringing the medium (white band) and soft (yellow band) tyres as the prime and option respectively. Whilst having one of the highest maximum speeds of any circuit, overall brake severity is low to medium and most other performance metrics are of a medium severity. The loss through the pit lane is high and the chance of a safety car is quite high too, with typically one per race. The weather can be pretty changeable in Shanghai with large temperature swings and the chance of rain - although hopefully not so dramatic as that encountered during the last race in Kuala Lumpur!" 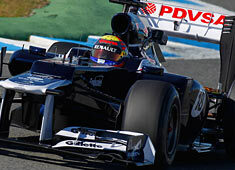 Pastor Maldonado: "Shanghai is one of my favourite circuits on the calendar so I am really looking forward to the race. The circuit has a nice combination of slow and medium speed corners and good sequences that are fun to drive. It is also very challenging because it is difficult to get close to the car in front to take advantage of the long DRS zone. We have shown good pace in the first two races and hopefully we can continue to improve here and pick up some points." Bruno Senna: "The car is performing well and showing strong pace so I am confident about our chances in China. I have not raced there for two years so I will have to work hard to re-learn the track, but I have good memories of the circuit because it has a good mix of high speed and low speed corners and good overtaking opportunities. I had a good race in Malaysia and hopefully I can continue that form in Shanghai." Rémi Taffin, Head of Renault Sport F1 Track Operations: "Shanghai is quite a different challenge from Sepang, with the long straight at the back of the circuit and the pit straight raising the percentage of time spent at full throttle. The slower corners, particularly the first complex, however mean the engine is used at relatively lower revs for the rest of the lap. We used the intervening time between Malaysia and China to thoroughly investigate the engine failure we had on Pastor’s car in Malaysia and quickly identified it as a piston failure. As a result we are looking to put in place safeguards to prevent it happening again to Williams or our other clients." Paul Hembery, Pirelli Motorsport Director: "For China, we’re bringing the P Zero White medium and P Zero Yellow soft tyres, which we think will be well-suited to the circuit. Last year, we witnessed one of the best races of the season in China, so there is a tough act to follow. Nonetheless, we’re confident that the choices we’ve made should put an even greater emphasis on strategy - and will form a different challenge to Melbourne, when we first used this combination."